Welcome to Downtown Daytona Live. 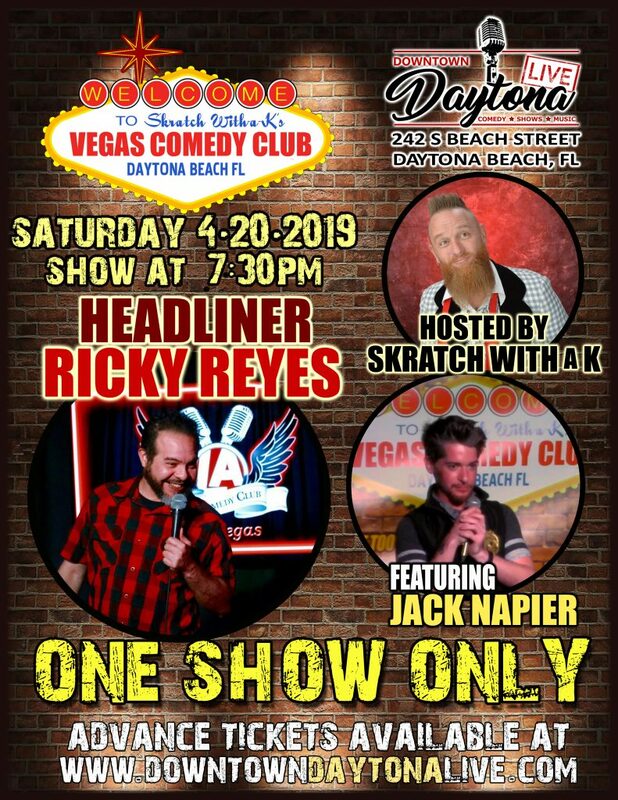 The best in live entertainment in Daytona Beach including Skratch with a K’s Vegas Comedy Club and Live Music Shows. Ricky hits the stage like a technician. He uses the microphone, stage, and his voice like an F-14 fighter pilot; dropping his point of view like sidewinder and sparrow missiles on unsuspecting crowds, causing explosive laughter and collateral damage everywhere. He can be heard on XM and Sirius radio as well as seen at clubs and colleges across the country. Growing up in a family of five kids, Ricky wore a lot of hand-me-downs. This may not seem unusual, but the difference was that he had four sisters. Ricky has been featured on Comedy Central’s Lounge Lizards. Jack Napier is kind of famous around Daytona Beach, he show is never predictable but always hilarious. Patricia Miracle did an awesome job at the Comedy Roast of Frank Scott. This was her first shot at comedy and she brought down the house. This is just a small portion of her set. Thanks to all the "Roasters" for making this such a fun night at Downtown Daytona Live!